There are few things I hate more than checking out an open-source project and spending two hours trying to build it. This is why I did my best to make Manalyze as easy to build as possible. If these few lines don't work for you, then I have failed at my job and you should drop me a line so I can fix this. Get the Boost libraries from boost.org and install CMake . Add an environment variable BOOST_ROOT which contains the path to your boost_1_XX_0 folder. git clone https://github.com/JusticeRage/Manalyze.git && cd Manalyze && cmake . A Visual Studio project manalyze.sln should have appeared in the Manalyze folder! Place the two folders in the external folder as external/yara and external/hash-library respectively. Then run cmake . -DGitHub=OFF and continue as you normally would. All the binaries in this archive are signed with a certificate ‎presenting the following fingerprint: 26fc24c12b2d84f77615cf6299e3e4ca4f3878fc . Since ClamAV signatures are voluminous and updated regularly, it didn't make a lot of sense to distribute them from GitHub or with the binary. When you try using the ClamAV plugin for the first time, you will likely encounter the following error message: [!] Error: Could not load yara_rules/clamav.yara . In order to generate them, simply run the update_clamav_signatures.py Python script located in bin/yara_rules . Run the script whenever you want to refresh the signatures. -h [ --help ]         Displays this message. -v [ --version ]      Prints the program's version. argument. Multiple files may be specified. -o [ --output ] arg   The output format. May be 'raw' (default) or 'json'. -x [ --extract ] arg  Extract the PE resources to the target directory. 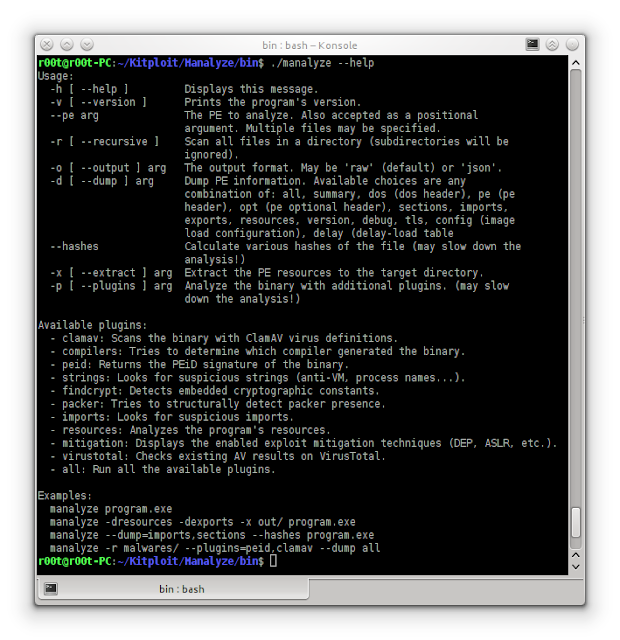 - clamav: Scans the binary with ClamAV virus definitions. - compilers: Tries to determine which compiler generated the binary. - peid: Returns the PEiD signature of the binary. - strings: Looks for suspicious strings (anti-VM, process names...). - findcrypt: Detects embedded cryptographic constants. - packer: Tries to structurally detect packer presence. - imports: Looks for suspicious imports. - resources: Analyzes the program's resources. - mitigation: Displays the enabled exploit mitigation techniques (DEP, ASLR, etc.). - authenticode: Checks if the digital signature of the PE is valid. - virustotal: Checks existing AV results on VirusTotal. - all: Run all the available plugins.